Take sugar in a heavy bottomed pan. Add a splash of water and mix well with a spoon. Now turn on the heat and take off the spoon, otherwise the spoon will crystalize the sugar. Let it boil. Swirl the pan often but never stir using a spoon. After some time it'll bubble up & then little darker. Slowly it becomes a little more dark color (Reddish brown) & here it'll reach perfect caramel. If the splash of water is omitted then it'll 'Dry Caramel' , otherwise 'Wet Caramel'. To line a mould / ramekins , immediately pour the caramel. Coat on all sides & keep that aside to set completely. Cream or butter can be added to caramel right when it reaches the desired color and depth-of-flavor. The warm cream will incorporate more smoothly in the hot caramel than cold cream. 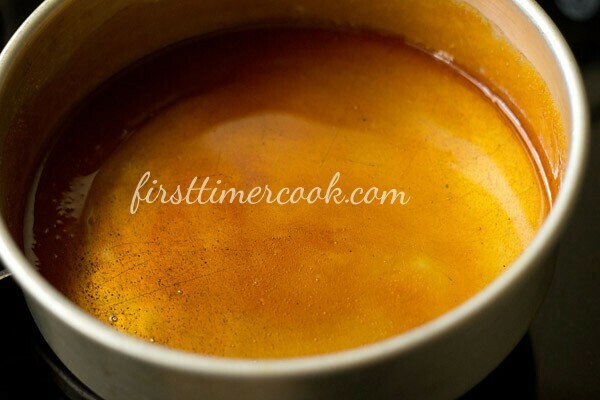 ​Use caramel (with no cream / butter added) straight by pouring a small amount over the custard, turning it to create a thin layer, and letting it cool at room temperature. Don’t refrigerate, otherwise it'll become soggy. Always a heavy bottomed pan is recommended for making caramel.